This is my fourth visit to Cambridge, which makes Cambridge the British university that I have visit most often. · I have been here to tell China's story of development and answer questions. · I have been here for promotion of China-UK educational exchange and scientific and technological cooperation. · And I never fail to come away inspired by new observations and stimulating thoughts. What has always impressed me most of all is that the University of Cambridge, one of the best in the UK, has always been at the fore-front in China-UK exchange and cooperation. This is reflected in the exhibition that celebrates Ye Junjian that has gathered us all together today. This exhibition once again proves the leading role of Cambridge. It is the very first of its kind in two aspects. It is the very first commemorative events for the 70th anniversary of the Second World War that I have attended. The Ye Junjian exhibition brings back memories of two devastating wars fought seventy years ago. · One is the world anti-fascist war. Seventy years ago, China and the UK fought side by side for peace and justice. Together, our nations went through horrific levels of blood and fire of war. The peoples of both our countries made enormous sacrifices. · He shared stories of the desperate fight that the Chinese people had put up against the Japanese invaders. · He won over immense sympathy and support from the British public. · When Ye Junjian later went to King's College to pursue further studies he continued to tell his British friends about the threat that Chinese people were facing as World War II raged in many parts of the globe. · We remember him and make the record clear for that particular part of history. · We remember him so as to carry forward China-UK friendship forged during that war. · We remember him as a demonstration of our resolve to uphold the outcome of the World War II victory and to safeguard world peace and stability. o Seventy years ago China and Britain were allies against common enemy. o Seventy years on China and Britain are partners for win-win cooperation. Now let me turn to the other significance of Ye Junjian exhibition. · The UK Season lasted from January to June. · The China Season began in July. · Today's opening of Ye Junjian exhibition is one of the first events of the China Season. Ye Junjian was a Cambridge alumni and a well-known Chinese writer and literary translator. He had made unique contribution to China-UK cultural exchange. We remember him with this exhibition so that we could carry forward the people-to-people exchanges and deepen China-UK cultural cooperation. In October, at the invitation of Her Majesty The Queen, President Xi Jinping will pay a state visit to the UK. This visit will be a new milestone in China-UK relations. It will herald a 'golden time' for the bilateral relationship. As we get ready for the "golden time", I hope that everyone from every walk of life will come together and take an active part in strengthening the China-UK relationship. · Cambridge can become a base for training Chinese talents. 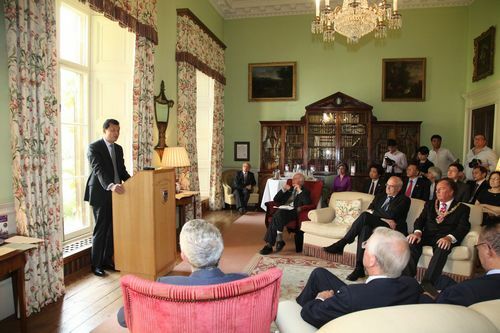 · Cambridge can become a hub for intensive cooperation in scientific research between China and the UK. 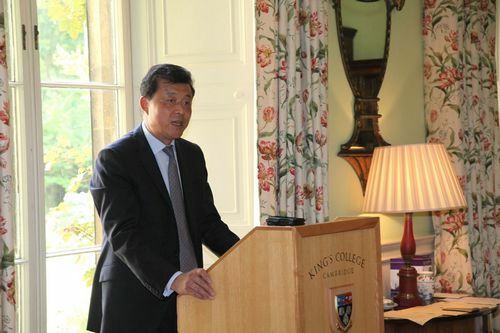 · And Cambridge can become a centre for contemporary China studies. 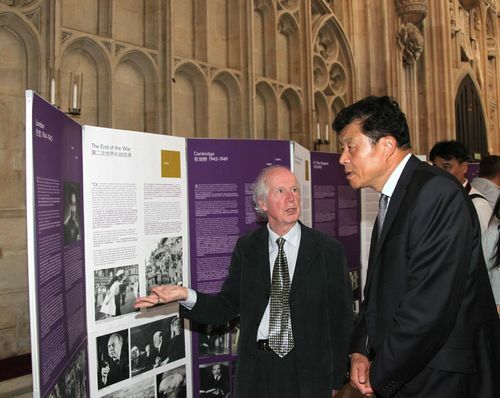 I hope and believe Cambridge will make its unique contribution to the 'golden time' of China-UK relations. In conclusion, I wish the Ye Junjian exhibition a complete success!